"THE best karting facility in the country" was the host of "the best race meet we've had in Central Queensland for years, if not ever". 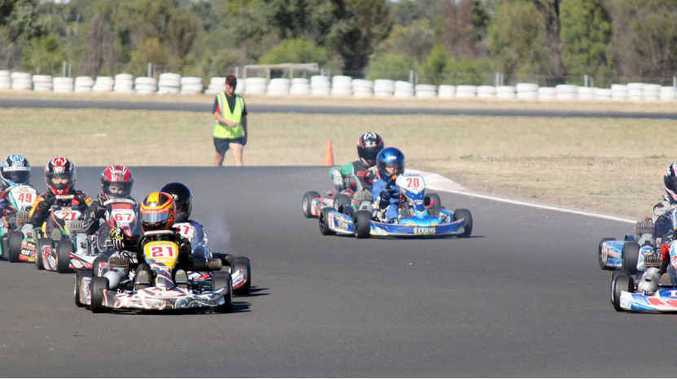 The Emerald Karting Club's turn to host Round 1 of the CQ Series could not have gone better, president Shane Nixon said. "The Emerald members really shone," Nixon said. "Adrian (Maguire) would've been the pick of them. "He wasn't headed all day. "He just drove flawlessly over the whole two days. "That's a very good display of racing." Nixon said the Emerald Kart Track had everything anyone could ever ask for in a race track. "It's got undulations, it's got tight corners and big, long sweepers," he said. "Everyone that comes here and sees it, says it." Maguire was not the only Emerald driver to impress, with Mack Nixon involved in a thrilling four-way battle with Jac Preston, Ty Spencer and Jett Johnson. "He was mixing it with them," Nixon said. "They were very good racers. "They were separated by half a second. "It was very entertaining racing." Thanks to the efforts of Maguire, Nixon and others, Emerald is hopeful of success in the CQ Series. "Right at the moment, Emerald is looking good," Nixon said. "We're looking at taking out the series this year. "After this one we're leading it by a quite comfortable margin."